Overall – was a great week of running. the heatwave finally broke – which made the speed intervals on Wednesday really not feel so bad. i was surprised actually… one of the best “quality” workouts i’ve had so far. also – kudos to new york road runners for a great paced run in central park yesterday morning… i got in a nice 12 mile run and kept myself within the pace i needed to. today? not so much – i ran my easy 4 mile run just about a full minute faster per mile.. but i still felt great – so that’s gotta count for something, right? ready to take on week 5 – can’t believe i’m a full month into this program, and just about into august. Week three… and i’m in deep. closing in on 30 miles this week. the most incredible part of this, is the insane heat wave that happened in NYC this past week. a year ago, i would have (maybe) hit a treadmill, and more likely just not run. i don’t like the heat. i get lightheaded, dizzy, and just plain miserable. but not this year – i ran. i consumed gallons of water, and i ran. i’ve been told i’ll be a rockstar in the fall when the weather turns cooler – we’ll see. for now – i’m just learning to love the heat. i also dusted off my road bike and took it out for a spin (twice around central park) – after an 8 mile run this morning. the tires have been sinking into my floor since last october – when it was last on the rode (and not even by me!) – it was a great feeling to spin around the park. reminded me of my childhood and my favorite bike with the blue, sparkly banana seat. boy, could that bike tell stories. last but not least – check out the bright new tang colored sneakers. 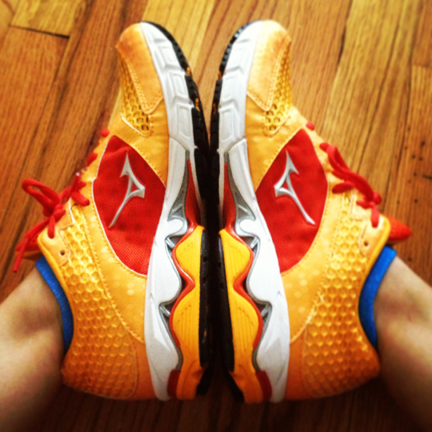 turns out i don’t pronate anymore, and i get to indulge in the lighter, brighter mizunos. (did i mention cheaper as well)? and i’d be remiss to say – that i now am the proud owner of a swimcap. my friend swears she’ll turn me into a triathlete yet. in my mind – i’m just thinking some fun cross training while i run these insane miles.. and also good practice for the surfing lessons i plan to take in hawaii in november. hard to believe i’m heading into week 4 of the mtp program. this upcoming week should be a challenge. serious, fast speed intervals, and a 12 mile run next saturday. but at least the 95+ heatwave finally broke. marathon training is now well underway, and of course, so is another one of those typical, sultry heat waves we get in NYC every summer. and a few days after that – i ran the NYRR MLB 5K out in Prospect Park. think 90% humidity – it was hard to say the least. i came up short 2 minutes of my goal.. but for the first time in my short running career – i finished in the top 50 of my age group – so feeling really good about that. 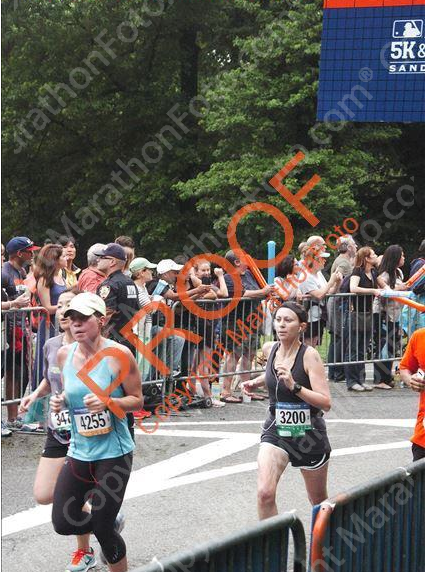 Here i am crossing the finish line.. (or coming near it) – one thing i’ve learned in my 3 years of running.. is that you always need that kick – no matter how hard it hurts, how tired you are.. how much you really just want to stop. never stop.. dig your heals in, and pass every last person in your view… so there you go. my sage advice of the week. One week down….SEVENTEEN weeks to go. I’m happy to report the first week went pretty well. 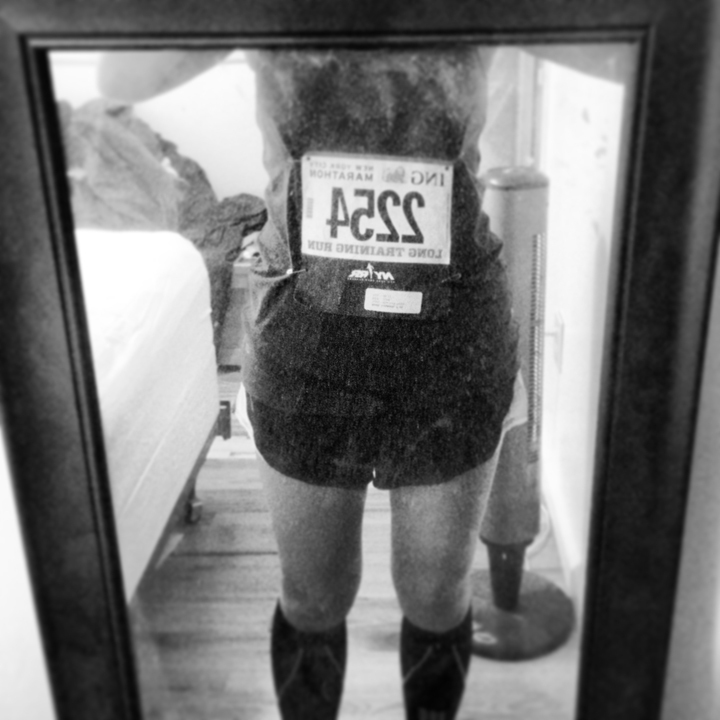 In case you missed any previous blog posts, i’ll be counting down to my very first marathon… the NYC ING Marathon. I’ll be checking in once a week (i hope) to give an update. This week – it was HOT in NYC. Did I mention HUMID with that? I generally do not fare well in the heat, but I have to say, i’m getting better at it. I had my first official speed work with my coach (Andre from the Run S.M.A.R.T. Project).. we ran 200’s – which i’ve never done before. certainly a challenge, and my legs were a bit sore a few days after. wondering why there is a picture of 2 Garmins? 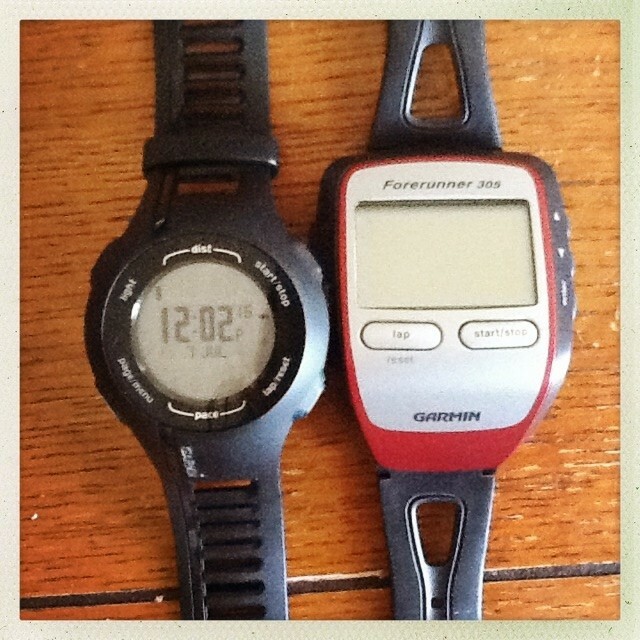 Long story short- Garmin #1 on the left is my usual – but i ran in the rain last week and it shorted out. in a moment of panic, i bought a back-up – the big mama on the right – Garmin 305. which, i must say – i love the details that one offers up better than my tried and true.. just don’t know if i can race with that kind of bulk on my small wrists.. time will tell. beyond the first coached work-out, the Garmin mishap – first week was pretty seamless and i clocked in about 24 miles. i have a great group of people in my group – and looking forward to getting to know all of them a bit better… they are all Flyers (like me) – but i just haven’t run with all of them. one “friend” i hope not to run into again – was mister-most-gigantic-rat-i’ve-ever-seen-in-my-life.. in Prospect Park of all places. I was coming to the end of my 90 minute run – and at the top of the park near Grand Army – this beast ran in front of me – at first i thought it was a squirrel, but oh no… a rat that rivals the size of a cat. until next week…. i’ll be running.